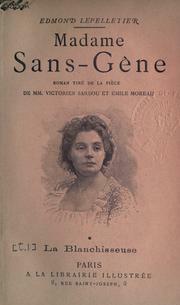 5 editions of Madame Sans-Gêne found in the catalog. Add another edition? Are you sure you want to remove Madame Sans-Gêne from your list? roman tiré de la pìece de V. Sardou et Emile Moreau. Published 1894 by Librairie illustrée in Paris . November 6, 2008 Created by ImportBot Initial record created, from Internet Archive item record.